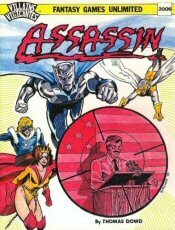 Complete rules for: Origins of super-heroes; Super-powers; Use of super-powers; Costumes; Secret identities; Scientific inventions; Encounters; Captured secret equipment; Immunity from the law; Penalties for captured villains; Super-hero & Super-villain organizations. 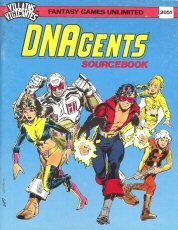 All you need to know to create a world of comic book style adventure. 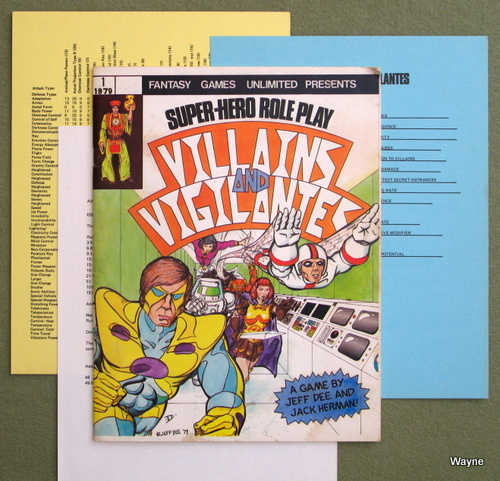 "Villains & Vigilantes is a role-playing game simulating the lives and adventures of comic-book style superheroes. It involves a referee, hereafter called the Gamemaster or GM, and one or more players (as many as the GM feels comfortable with). 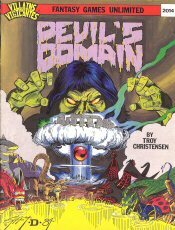 It is the Gamemaster's job to create the world wherein the players have their adventures, to play the parts of the inhabitants of his world, and to generally keep the players entertained and the game running smoothly. 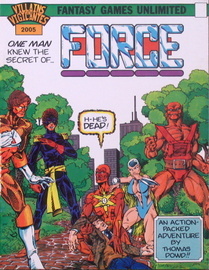 Players take the roles of superheroes. 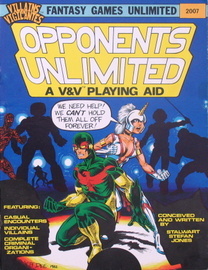 But unlike most role-playing games, in V & V the character used by the player is himself with the addition of super-powers. 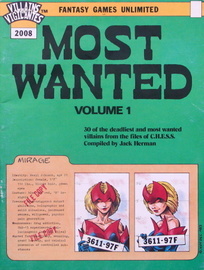 Each player receives a random set of powers, then creates a costume and a name in order to fight crime and protect society. As the players gain experience, their abilities will increase, along with the difficulty of the tasks they will be called upon to perform." 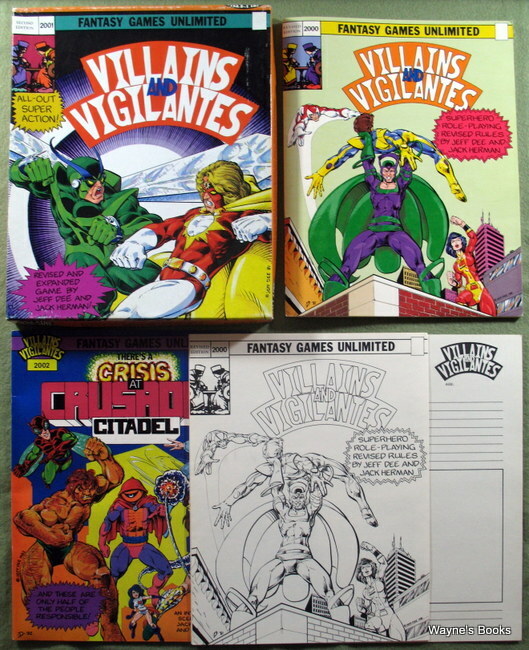 "VILLAINS & VIGILANTES is a complete role playing game based on comic book style superheroes. 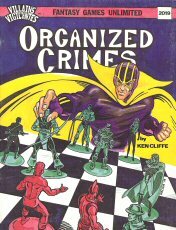 The game includes complete rules for character generation, super powers, secret identities, organizations, devices, super villains, and adventure creation. 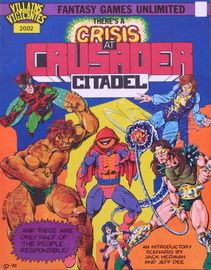 Also included in this box are a character sheet, reference charts for the Game Master, and the complete adventure CRISIS AT CRUSADER CITADEL." 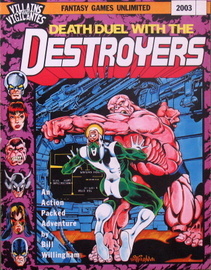 A sequel to the scenario Death Duel with the Destroyers. 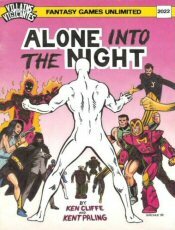 Early printings did not include counter sheets. 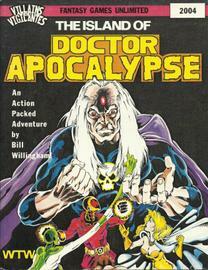 "Here's a fantastic adventure for the Villains and Vigilantes game system. Who is out to kill a United States senator? And why? 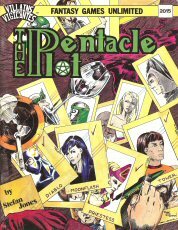 Can the heroes stop the assassination and learn what is really behind Senator Bennett?! 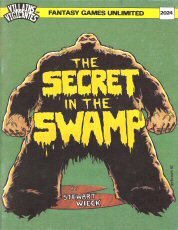 There's more to it than meets the eyes in this action-packed adventure for 3 to 5 superheroes." 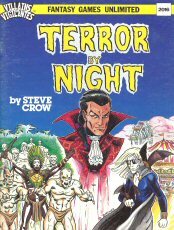 "Included are over two dozen NPCs, with casual encounter ideas and four complete evil organizations!" 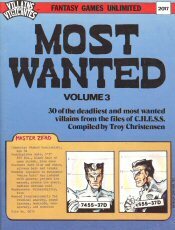 "30 of the deadliest and most wanted villains from the files of C.H.E.S.S." "It began with a tropical storm in the ocean near Bermuda -- a storm which grew to a hurricane, and kept growing! First small fishing boats and then aircraft and entire oil tankers disappeared one by one -- will America be next? 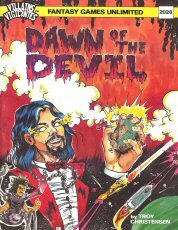 A demonic adventure for the V&V game!" 30 villains, 100 color counters on two sheets, and conversion notes to Superworld, by Chaosium. "WHY IS SOMEONE TRYING TO KILL THE VISITING JAPANESE BUSINESS MAGNATE? IS THERE MORE TO IT THAN MEETS THE EYE? 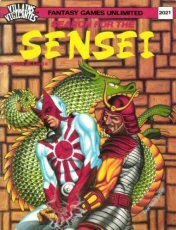 AND, CAN THE SUPERHEROES DEAL WITH THE SKILLED ASSASSINS INVOLVED, THE NINJA? 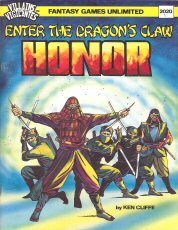 HONOR IS AN ACTION-PACKED ADVENTURE FOR THE V + V GAME SYSTEM." 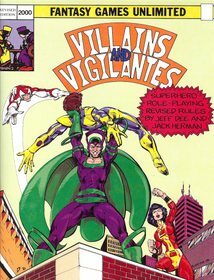 "Here's a trio of terrific solo mini-adventures for the Villains and Vigilantes game system. 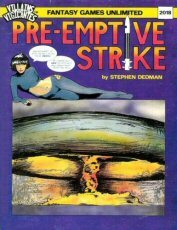 One hero takes on a triple threat of short scenarios provided for the gamemaster. Mystery and mayhem await the hero in his own fair city to the great white north! 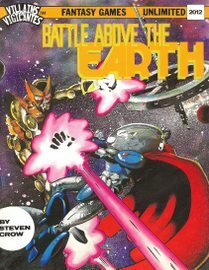 From street gangs to robot gangs to gangsters, it's all here in these excitement-filled mini-adventures." "Heroes beware!! 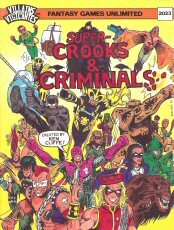 Super-Crooks & Criminals are here! 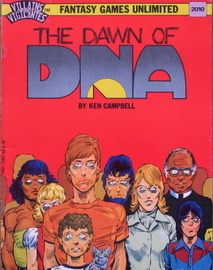 From all over the Earth and dimensions beyond come more evil-doers to threaten the innocent. Read about these fascinating new fiends - their powers and personalities, weapons and weaknesses!" 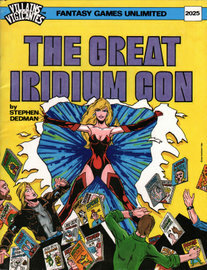 "IN THE MOOD FOR A GOOD SCI-FI- COMIC CONVENTION? THE CONFEDERATION AND THE SEVEN SERVANTS TO SARGATANAS CERTAINLY AREN'T... AND THEY'LL SPOIL EVERYTHING UNLESS YOU AND YOUR TEAMMATES CAN STOP THEM! 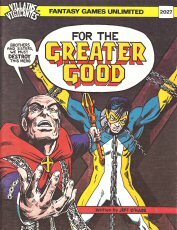 ANOTHER DYNAMIC VILLAINS AND VIGILANTES SUPERHERO ROLE-PLAYING GAME!" 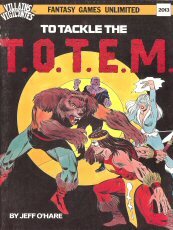 "THE UNIQUE AND EXCITING SUPERHERO TEAM TRANSLATED INTO ROLEPLAYING GAME TERMS. COMPLETE AND DETAILED CHARACTER BACKGROUNDS OF THE DNAGENTS, THEIR ALLIES, AND THEIR FOES. 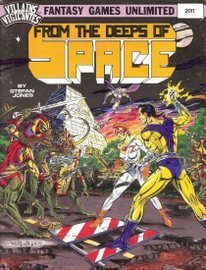 ALSO INCLUDING DATA AND MAPS OF MATRIX CORPORATION AND THE MAJ0R LOCALES FROM THE ECLIPSE COMICS. TWO COMPLETE ADVENTURES ARE ALSO INCLUDED!"